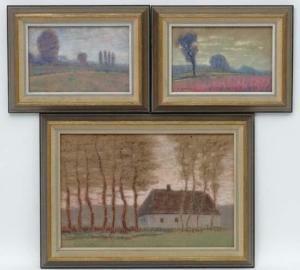 Find artworks, auction results, sale prices and pictures of Rudolf Mather at auctions worldwide. SELF PORTRAIT. 1929. 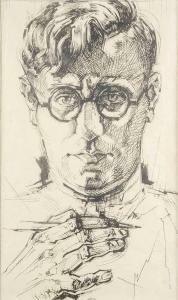 Dry point on silk paper, 40,6x24,3 cm (inside mount measurement), dated lower middle '1929', marked in pencil lower below the mount 'Autoportrét R. Mathera' (Self portrait of R. Mather). Mounted, framed, glassed. Condition B. SCENE FROM A WAR. 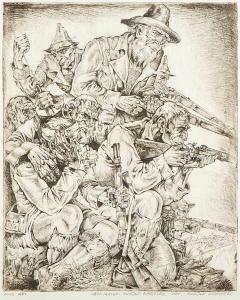 Etching on paper, 29,4x23,7 cm, marked in pencil 'Berg Isel / Dem Maler Rudolf Karasek von Rudolf Mather' at the bottom. Mounted, framed. Condition B/C. PLACING TO A GRAVE. 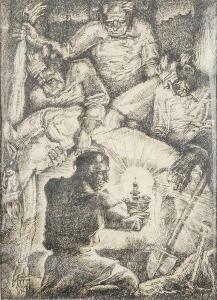 Etching on silk paper, 35,2x25,3 cm (inside mount measurement), marked in pencil 'R. Mather' below the mount. Mounted, framed, glassed. Condition B.